Ensuring the health and safety of our residents is something we take very seriously and is top priority here at Generations at Oakton. And if we can have a little fun with the process it makes our jobs that much more enjoyable! 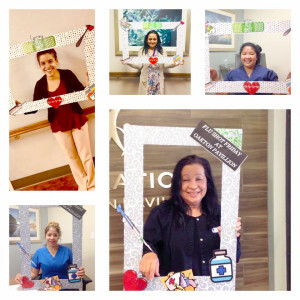 Our admissions Director Joclyn Abreu and receptionist Ericka Bustamante were the creative minds behind the “Photo booth” and “Picture Frames” encouraging our staff and setting the mark for the facility’s goal of 100% staff participation during flu shot season. On the first Friday of October we started our campaign to give the flu shot to staff when they collected their paychecks with 80% of our staff vaccinated within the first 3 days. As the month drew to an end, our staff reached their goal of 100% compliance. All of our staff has either received the flu shot or has an acceptable declination. The Centers for Disease Control (CDC) recommends that everyone 6 months of age or older be vaccinated against the flu. Flu shots are the most effective method to protect against this virus and its related complications. The CDC also states it’s important for individuals who work in long-term care, to get vaccinated against influenza each year. Our staff at Generations at Oakton wants to encourage everyone to get vaccinated this season. Generations at Oakton is our family caring for your family for generations to come!